Mindfulness meditation can involve breathing practice, mental imagery, awareness of body and mind, and muscle and body relaxation. One of the original standardized programs for mindfulness meditation is the Mindfulness-Based Stress Reduction (MBSR) program, developed by Jon Kabat-Zinn, PhD (who was a student of Buddhist monk and scholar Thich Nhat Hanh). MBSR focuses on awareness and attention to the present. 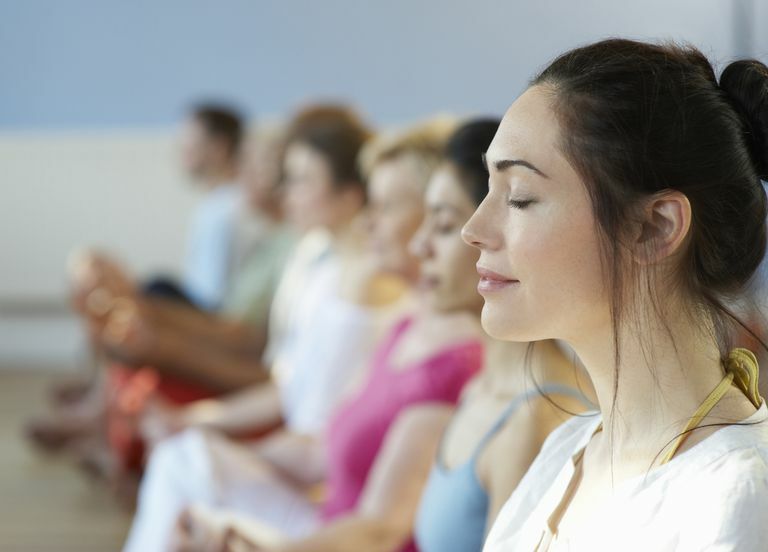 Other simplified, secular mindfulness meditation interventions have been increasingly incorporated into medical settings to treat stress, pain, insomnia, and other health conditions. 1. Find a quiet and comfortable place. Sit in a chair or on the floor with your head, neck, and back straight but not stiff. 3. Become aware of your breath, focusing on the sensation of air moving in and out of your body as you breathe. Feel your belly rise and fall, and the air enter your nostrils and leave your mouth. Pay attention to the way each breath changes and is different. There's no law that says you must be sitting on a cushion in a quiet room to practice mindfulness, says Hanley. Mindfulness mediation is one technique, but daily life provides plenty of opportunities to practice. Doing the dishes. Have you ever noticed how no one is trying to get your attention while you're doing the dishes? The combination of alone time and physical activity makes cleaning up after dinner a great time to try a little mindfulness. Savor the feeling of the warm water on your hands, the look of the bubbles, the sounds of the pans clunking on the bottom of the sink. Zen teacher Thich Nhat Hanh calls this exercise "washing the dishes to wash the dishes"--not to get them over with so you can go watch TV. When you give yourself over to the experience, you get the mental refreshment of a mind-body practice and a clean kitchen. It's multi-tasking at its best! Brushing your teeth. You can't go a day without brushing your teeth, making this daily task the perfect opportunity to practice mindfulness. Feel your feet on the floor, the brush in your hand, your arm moving up and down. Einstein said he did his best thinking while he was shaving--I'd argue that what he was really doing in those moments was practicing mindfulness! Driving. It's easy to zone out while you're driving, thinking about what to have for dinner or what you forgot to do at work that day. Use your powers of mindfulness to keep your attention anchored to the inside of your car. Turn off the radio (or turn it to something soothing, like classical), imagine your spine growing tall, find the half-way point between relaxing your hands and gripping the wheel too tightly, and bring your attention back to where you and your car are in space whenever you notice your mind wandering. Exercising. Yes, watching TV while running on the treadmill will make your workout go more quickly, but it won't do much to quiet your mind. Make your fitness endeavors an exercise in mindfulness by turning off all screens and focusing on your breathing and where your feet are in space as you move. Bedtime. Watch your battles over bedtime with the kids disappear when you stop trying to rush through it and simply try to enjoy the experience. Get down to the same level as your kids, look in their eyes, listen more than you talk, and savor any snuggles you get. When you relax, they will too. Goyal M, Singh S, Sibinga EM, et al. Meditation programs for psychological stress and well-being: a systematic review and meta-analysis. JAMA Intern Med. 2014 Mar;174(3):357-68. Kabat-Zinn J. Mindfulness Meditation: Health benefits of an ancient Buddhist practice. Mind/Body Medicine, eds. Goleman D, Gurin J. New York: Consumer Reports Books; 1993.